This inaugural demonstration camp was the “proof of concept”, and the concept seems to work: a girls-only math camp, focusing on what they’ll see come the new school year. For the next SuperGirl Math Camp coming up August 5-9 (also for fifth graders), we have nine girls signed up, one slot remaining. 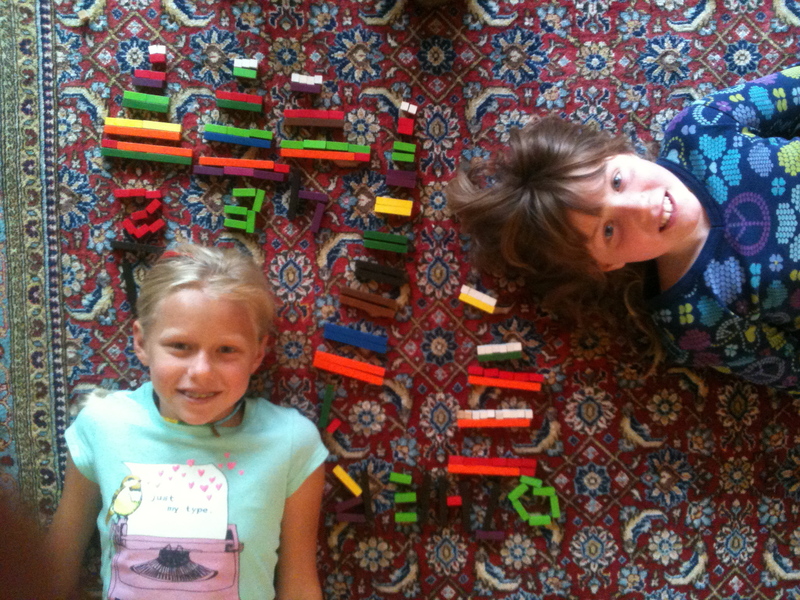 I promised the girls that we would begin and end end each day with “Weird”, an unusual application of fractions. 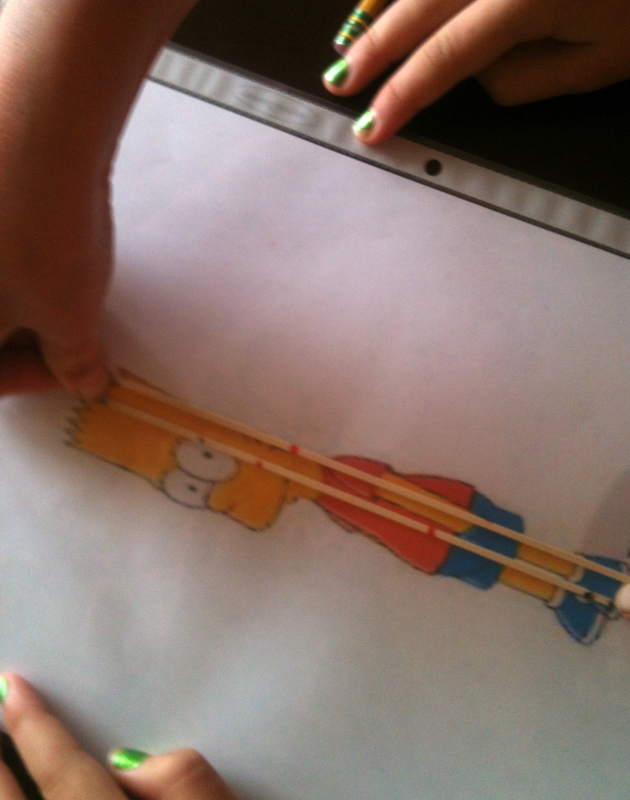 On our first morning, we studied the proportions of Bart Simpson and other characters using marked-up rubber bands. You can see that Bart’ head measures a little more than a third of his overall height. 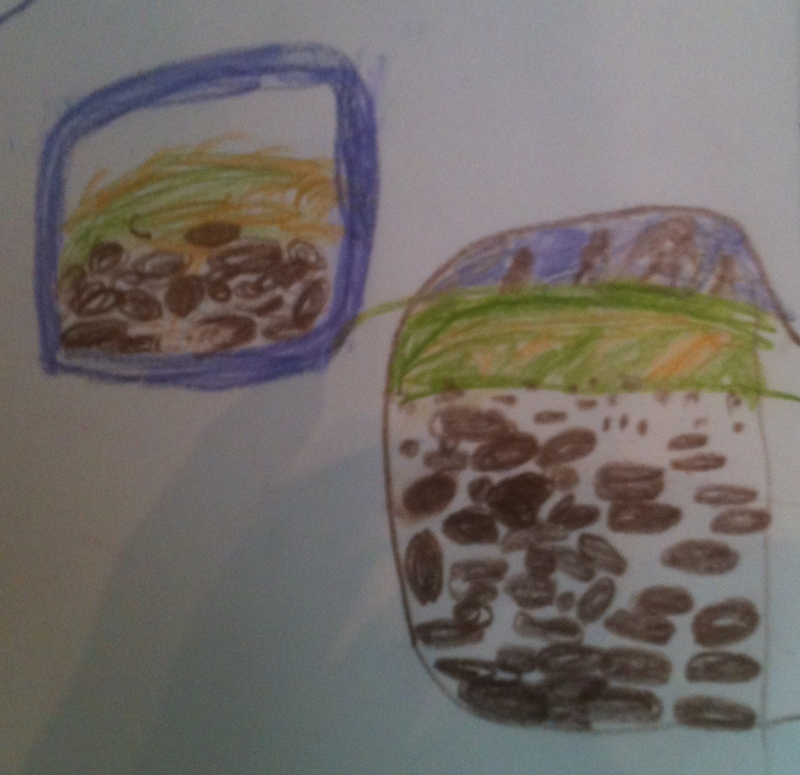 We did two experiments applying ratios to cooking. 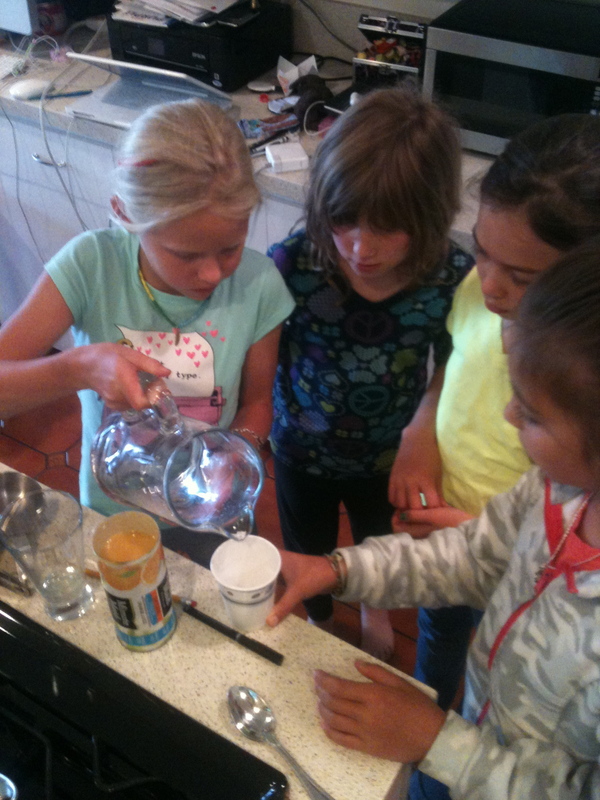 One with orange juice: can the girls taste the difference between a 1:3 concentrate:water and a 2:5 ratio? 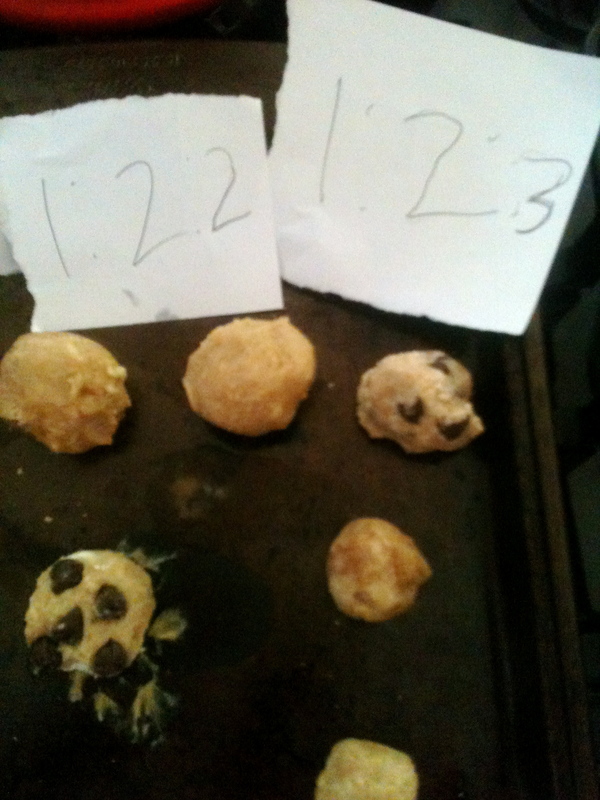 Our second ratio experiment, trying different ratios of butter:sugar:flour for cookies. We also added various toppings. At first they referred to the cookies by their toppings (“the one with almonds and vanilla”) but they came to realize that toppings were superficial, and that the structure of the cookie was determined by the butter:sugar:flour ratio. Missing, for example, is a photograph of the inedible greasy cookie blob because the ratio of butter to flour was way too high. In the middle of each morning, we had two sessions of “Practice.” Here, the girls took 45 minutes to make representations of halves, thirds, and fourths. They are using Cuisenaire Rods, an elegant math manipulative that I’ve used to teach everything from kindergarten math to algebra. In the course of their work, we cleared up several misunderstandings they had about the nature of fractions. One of our two field trips was to the Hazel Wolf in the Brower Center, Berkeley, where there is an interesting exhibit on relationships and sociability — a relevant topic for fifth grade girls. 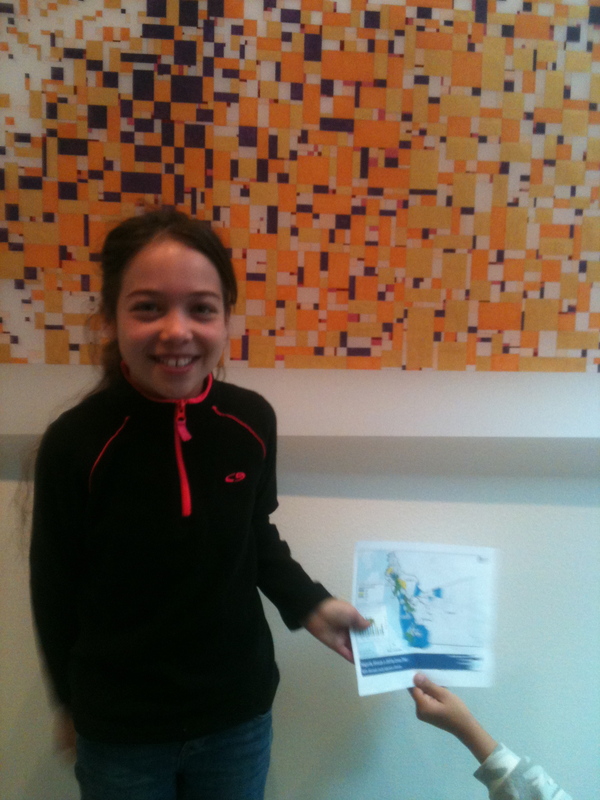 In the photo are two maps of race by Census tract in Alameda County, the usual way you or I would probably represent it on the paper, and a very different way of visualizing it in the artwork. Both are true; both are very accurate. 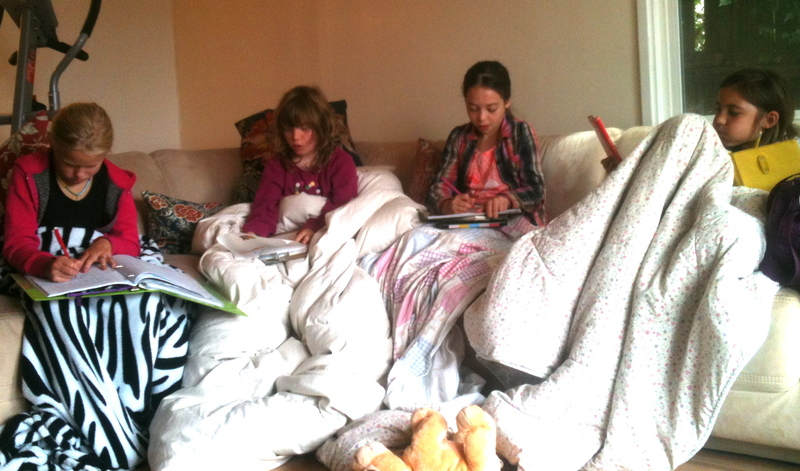 The girls stayed with this over a half hour to puzzle through the differences. We are fortunate to have camp in a home rather than in an institution, and we used the moods of three contrasting rooms for our daily Weird, Practice, and Talking Time (plus a fourth, the kitchen for our experiments.) During Talking Time, I asked questions that they answered in their math diaries and then shared aloud: what are your past experiences with math? when (in any field) have you taught yourself something new? And we continued the theme of “relationships.” Since we’ll be meeting twice a month during the school year, we discussed how we can support each other and work together as a team. During our Tuesday Math Walk, I posed a problem: “How much money does the City of Berkeley collect on this block in parking meter fees each day?” It took them 2 minutes, 51 seconds to solve, and I saw so many good morals from the process that I decided to go deeper into it. On Wednesday, after much discussion and several rehearsals, we shot a video reenactment of solving the parking meter problem. 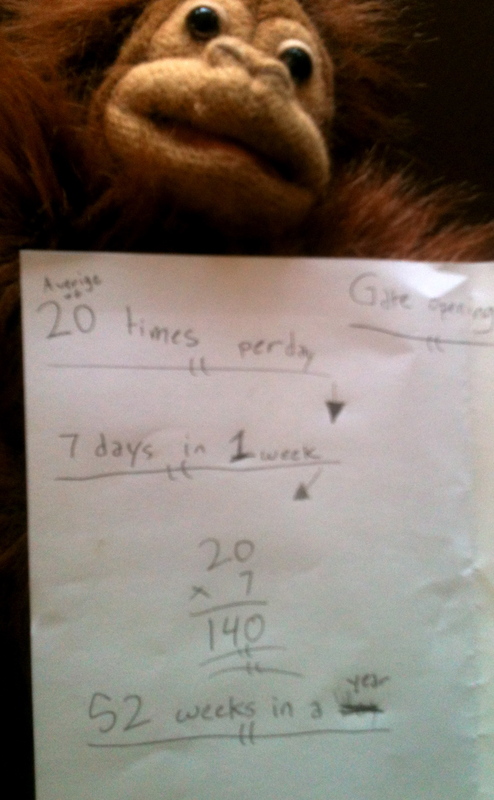 Then on Thursday, an unexpected payoff: overnight, one student spontaneously made up her own problem of a similar sort, “how many times does the gate in front of my house swing back and forth in a year?” She is starting to see her world differently! In the end, more important than giving the teacher the right answer is asking yourself interesting questions. … assisted by unidentified mathematician. 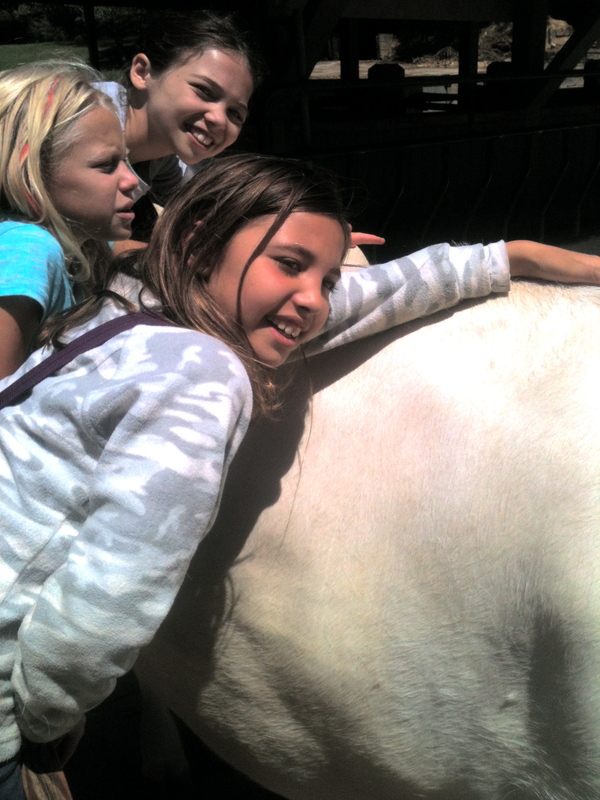 … our Tilden Park field trip, after solving “The Cow Problem.” .. too many stories to tell … The End.